One Grand Prize winner in the StorageMart "Pin to Win: Orgainze It 2013" Pinterest sweepstakes will receive $500 and a copy of the book, 75 Great Storing and Moving Tips. How To Enter "Pin to Win"
StorageMart, a self storage company, announced today that it will give away $500 and a copy of the book, 75 Great Storing and Moving Tips, to one Grand Prize winner in the company’s “Pin to Win: Organize It 2013” Sweepstakes. The sweepstakes is a Pinterest-based contest in which entrants build boards to encourage being more organized in the New Year. A survey conducted by Harris Interactive found that the number one New Year’s resolution of those polled was to get more organized. StorageMart’s Pinterest boards aim to inspire organization in the home and office and also include helpful tips for using self storage space. 2. Create a board that helps inspire organization in the new year. The board must consist of at least 10 pinned items, with at least five being re-pinned from the StorageMart page. 3. Pins should be tagged with #OrganizeIt and #StorageMart. 4. Submit a link to the completed board via the entry form on the StorageMart website. The grand prize winner will be chosen randomly from entries received before 9 a.m. (Central Time) on Wednesday, February 6, 2013. A number of second place winners will receive a copy of StorageMart’s book 75 Great Storing & Moving Tips. 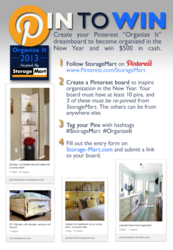 “Pin to Win: Organize It 2013” is the latest give away from StorageMart Gives, the charitable arm of StorageMart. Past contests have included the recently concluded “Draw My Favorite Teacher” to benefit public elementary schools in Oakland, California and Brooklyn, New York. StorageMart Gives has also conducted giveaways of tickets to concerts and sporting events as well as the biannual ScholarSmarts scholarship giveaway.